Today we had an amazing demonstration of yoroi kumi uchi by the Sensei , the Japanese shihan and Duncan and Holger. Yoroi kumi uchi is not about doing a technique it is about seizing the opportunities arising in the middle of the fight. At one point today, Duncan lost his helmet and immediately used it as a weapon against his opponent. Sensei congratulated him and explained that in a fight everything should be used to stay alive. Often martial art practitioners are more interested in looking good in their techniques rather than being in a position of staying alive. This is during the Muromachi period that Japan has developed what has become the martial arts of today. But in that time it was not about being precise, it was about not dying on the balltefield. Too often people think of the Edo period (beginning in 1603) as the best period of Japanese Budô. This is wrong! Everything has been discovered much earlier during the Muromachi period. 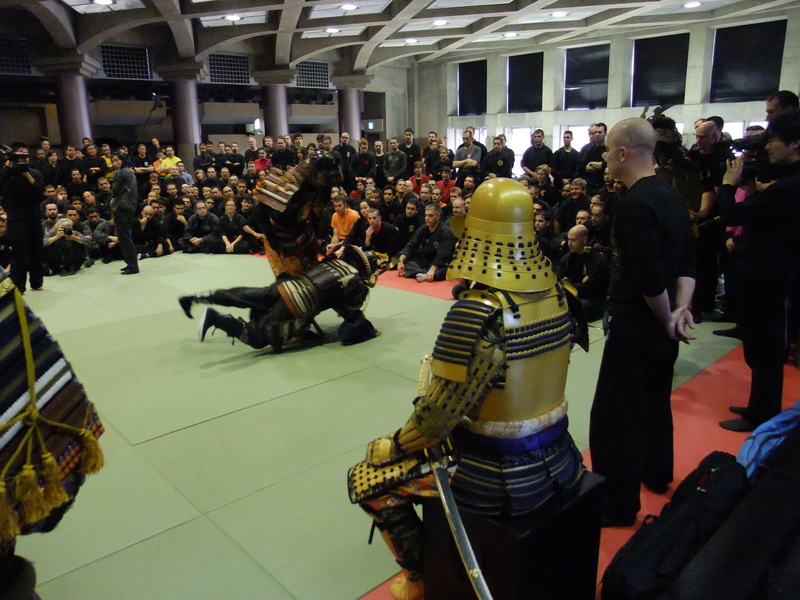 Muromachi began in 1333 so the Japanese had nearly 3 centuries to develop the arts of war. Sensei insisted once again today on the goshin (ken, tachi, juo, katana, nukes) being the real “gorin no sho”. If I understood well he will speak about that extensively in his new book due in a few months. Tachi waza is the weapon of the Muromachi together with the use of the yoroi. Japanese budô and the culture of the katana came shorlty after the peace time of the Edo period. Japan being unified, there were not so many battles anymore and the Japanese warriors stopped wearing the yoroi rendered unnecessary. This is when they developed the blade to be cutting like razor blades as it was possible (without the protection of the yoroi) to cut the opponent instead of stabbing him. Tachi waza doesn’t include cutting only stabbing. In the yoroi kumi uchi it is obvious. The body can take any blow at short distance (less momentum) the objective being to open uke in order to find a hole in the protection and to stab him in one of the openings created in the action. Therefore our movements do not have to be perfect they have to be created “on the spot” and adapted to what is possible. Sensei insisted a lot today on this aspect of fighting, we do not try to apply a waza we “read” the openings, take the balance and do what we can to stay alive. Once again we are learning survival not kata. Furthermore, yoroi kumi uchi makes it obvious that speed is not the priority as our movements are limited by the weight and encumbrance of the yoroi. We move to keep our balance and to take uke’s balance. Whether we a re doing mutô dori, tachi waza or yari waza is just an add-on to our body movements. The dvd on the dkms will be an eye opener for many bujinkan members as it was one for those who were lucky enough to watch it today. Train with a yoroi in mind and a tachi in your hand and adapt your good looking movements so that they can be of any use in a real fight. Arnaud – thanks for sharing your thoughts and insights with us! Great insight. More studying for me to do. Thank you! very clarifying… thanks for reporting notes on dkms to those that were not able to attend it! I wonder if the time has come to perhaps start to train in yoroi? Making them ourselves and start wearing them on training? Is it possible to understand it without the experience as such?